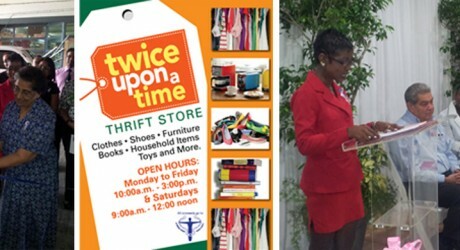 The Healthy Caribbean Coalition and the Trinidad and Tobago Cancer Society launched a thrift store to commemorate its 45th anniversary. Chairman emeritus, Dr. George Laquis and new patroness Mrs. Zalayhar Hassanali were part of the opening ceremony to mark the official opening of the Society’s first thrift shop, “Twice Upon a Time” on 24 June, 2014. Laquis told the story of how the Society had transformed over the last 45 years from its lone cobalt therapy machine to Mobile Screening Units which facilitate nationwide screening in Trinidad. He assured the public and attendees that the Society continues to provide several services including ultrasounds, prostate examinations, pap smears and mammograms among other services across the nation. Manager of Twice Upon a Time, Mrs. Meilin Harrilal-Mohabir, said that the public now had the opportunity to donate generously of used items in good condition including clothing, books, shoes, appliances, canned foodstuff and a host of other practical donations. According to Harrilal-Mohabir, the public is empowered to fight against cancer by shopping at the thrift store, a method not used in Trinidad until now. “I share in the vision of Dr. Laquis in establishing a world-class platform for both corporate and private citizens to support the TTCS”, said Harrilal-Mohabir. She encouraged the public to shop with the thrift store and assist in the programmes to fight cancer since proceeds go directly to the Society. The thrift store is located at 101 Eastern Main Road, Laventille, and is the vision of Dr. Laquis who is always looking for ways to fund the Society and its ability to diagnose cancers and assist those in need in the twin island Republic.